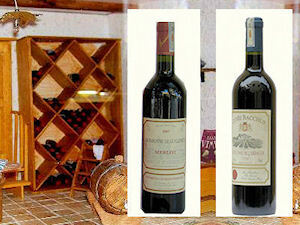 - Filling and wholesaling red wine in Vietnam market. Manufacturer and distributor of following Trademark™ for Vietnam : Château de Thussac, Domaine de Thussac, Cyrano de Bergerac, Celliers de France, Vin de Coeur, Château de Rayssac, Marquis de Rayssac, Château de Cazac, Tour de Cazac, Domaine de Cazac, Château de l'Aigle, Les moulins d'Angélie-Les-Lys, La boîte à Vin, France Pinot, Les vins de Jaloux, Les rives de Lézignac, Château Cazeau, Cuvée Saint Victorien, Cuvée Alexandrie, Casa Carajou, Hauts-Rayssac, Le Tonneau, Prince Thomas, Baron Saint Thomas, etc. 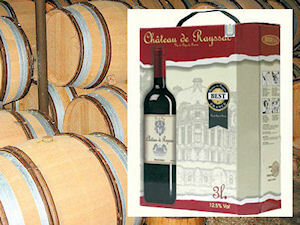 We are The specialist in French Wine in Bag-in-Boxes and bottles!!! 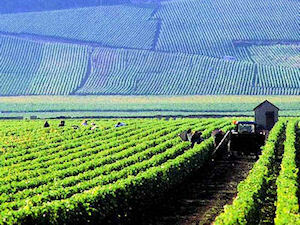 France is producing several hundreds or thousands of wine according to the method used to count( it châteaux, clos, marques, etc.). There are many varieties ( types of vines and grapes) .Each variety gives wines of character variable , depending on the soil, the nature of the ground, the position relative to the sun, the wine making, etc. 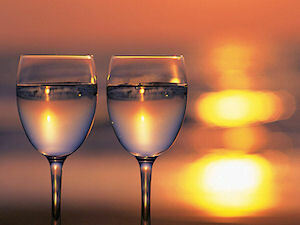 Weather permitting to get different wines , although of the same origin , by year , we talk about vintage. - Vins de Table become wine AOP VSIG (vin sans indication géographique), with name Vin de France with or without grape variety and vintage. 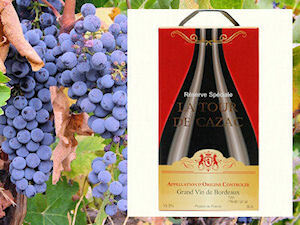 - Vins de Pays become wine IGP (indication géographique protégée). - AOC become wine AOP (appellation d’origine protégée).